Jyestha Nakshatra: Spread from 16:40' up to 30: degree Vrischika Rashi, Lord is Mangal, the deity is Indra, equivalent to Ravi, the King of the firmament. Indra is the great lord, the mighty warrior and a hero among heroes by tradition and in the plenitude of power he reigns supreme. He is the first among courtesans. When this star is unfavourable it causes sorrow and poverty. Anthropomorphically Middle finger and Neck of Kalapurush. Those born in the Jyeshtha star are fond of daily physical exercises, warriors, always respecting brahmins, famous and endowed with fine qualities. They gain fame, are bright, accompany kings, affected in mind, deeply idle, well known, and speak final. They are addicted to bad jobs, capable of undergoing difficulties, unbearable, cruel, untruthful and wealthy. They are tall and endowed with few children. They are pure and intelligent. They are religious and have a good circle of friends; they are poets and wise. They are generally dark complexioned, happy, stable and much learned. He is very clean in his mind and is very sober. But these good qualities will not be noticed by others as he does not believe in show. He cannot face even a small problem. He is the type of person to whom no secret should be told or given. He cannot keep anything hidden in his mind even if it pertains to his own life. Unless he keeps it open to others he feels that something is missing in his life and he fails to get a sound sleep till the time he discloses the secrets. 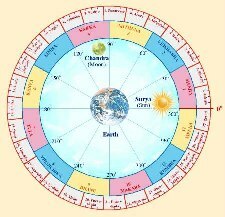 Several people born in this nakshatra have been coming to me and complaining that they do get a good sleep. When the reason for such a state of affairs was enquired into, they have all admitted that a peculiar vibration takes place in their mind and unless the reason for that vibration is leaked out they cannot rest. So they always wait for the next morning and try to tell these things to the very first person they come across. He is hot tempered and obstinate. Due to this temperament he often faces a lot of problems and forms a wall to his progress in life. He never accepts the advice given by others whereas he acts upon his own consciousness. For the sake of principles, he takes on-the-spot decisions on several matters without seeing the opportunity and circumstances, which ultimately lead him to an unsafe state. Due to his hot-headedness he will not hesitate in causing problems and troubles even to those who rendered him all the possible help when required. He may even ill treat those people. He cannot expect any help from his relationships. Outwardly, he appears to be very proud, but on a closer look it will be evident that it is just the opposite. He must avoid all the drugs and alcohol as he is prone to quickly losing his self-control which will spoil his hard earned reputation, create a hindrance to his profession and also in his family life. Few astrologers have suggested him to wear Yellow sapphire of 6 ratti and above. i am okay with these general results. but i am in search of perfect remedies for problems.